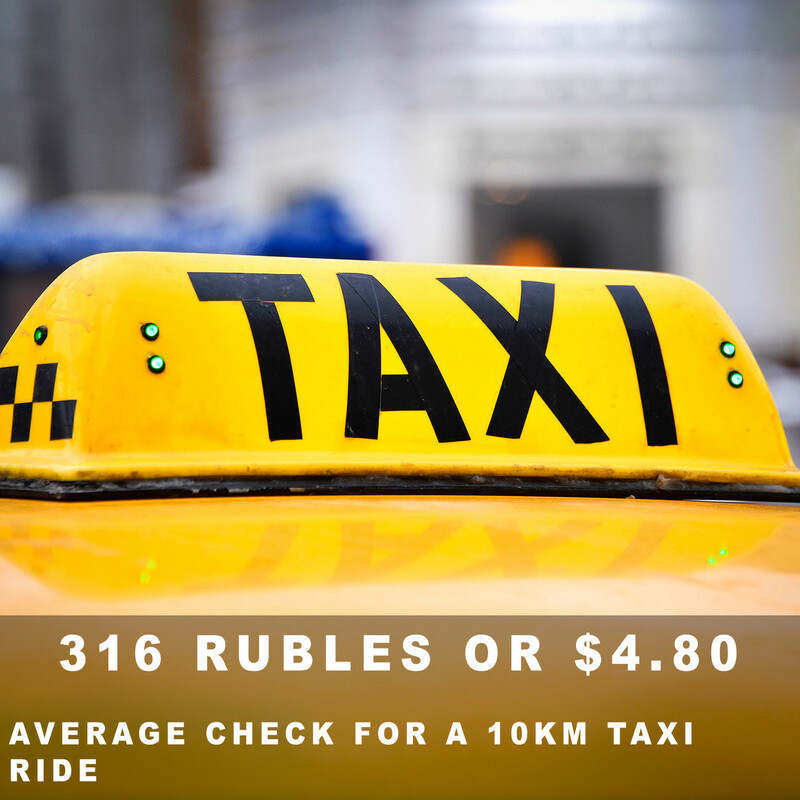 We calculate the cost of Russia's main tourist trail: from taxis to cocktail prices. Taxi, bus, train? 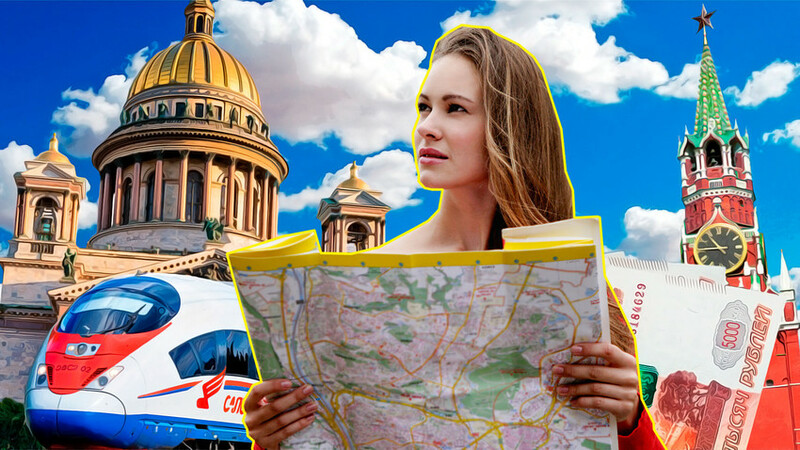 The first question you will face is how to get from the airport to central Moscow. 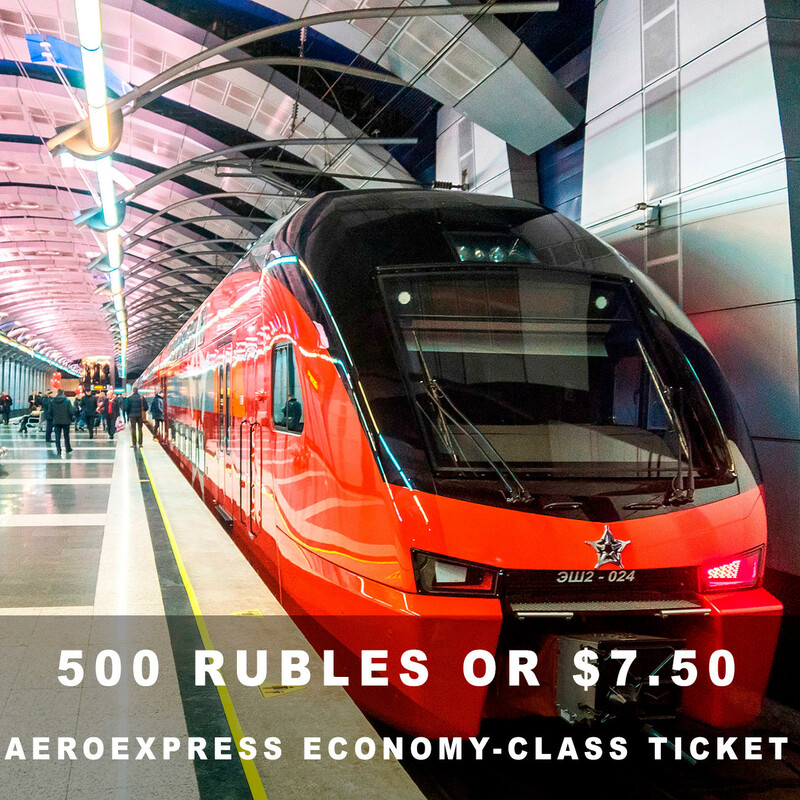 In terms of price, comfort, and speed, the best option has to be the Aeroexpress train. It goes non-stop direct to the city center. 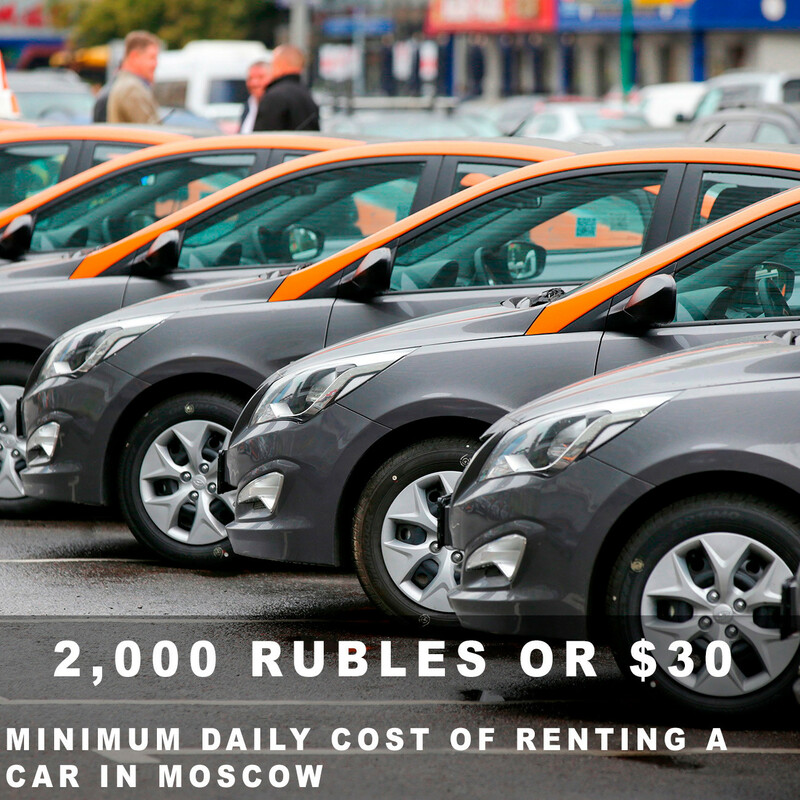 But there are least five other ways to do it (from Sheremetyevo, Domodedovo, and Vnukovo), including car sharing and vehicle hire. 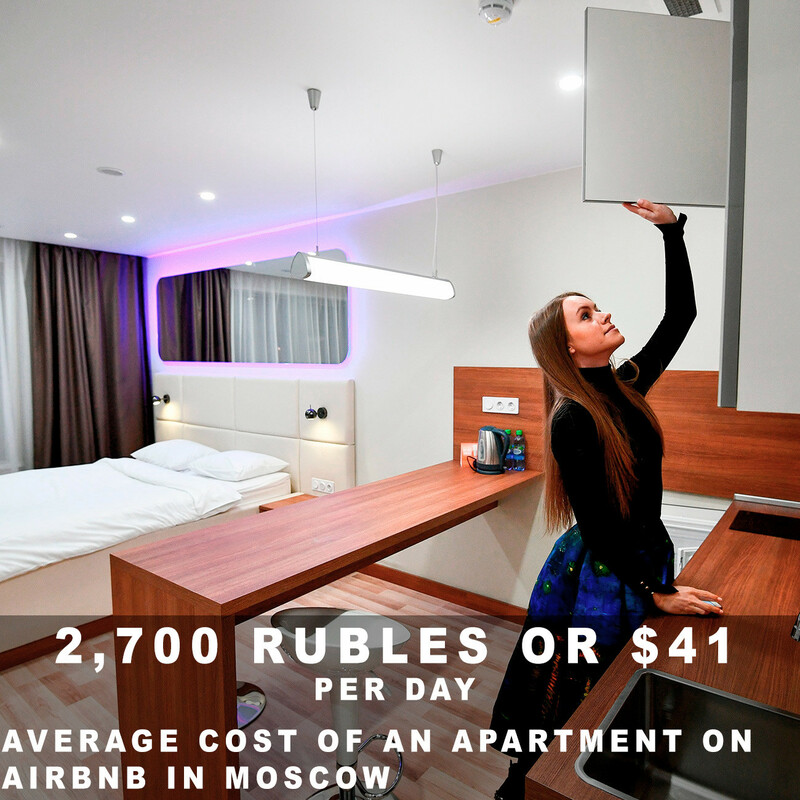 Moscow has every accommodation option there is, from hotels and hostels to Airbnb and CouchSurfing. The starting price for a hostel is 250 rubles ($3.70), while the average price for a decent 3-star hotel is 3,800 rubles or $57 per day. See our article on choosing accommodation in Moscow for every travel occasion. A good tip is don’t overlook the suburbs—the Moscow subway extends a long way, and even from far out the ride to the center will take no more than 30 minutes and cost 55 rubles ($0.80). 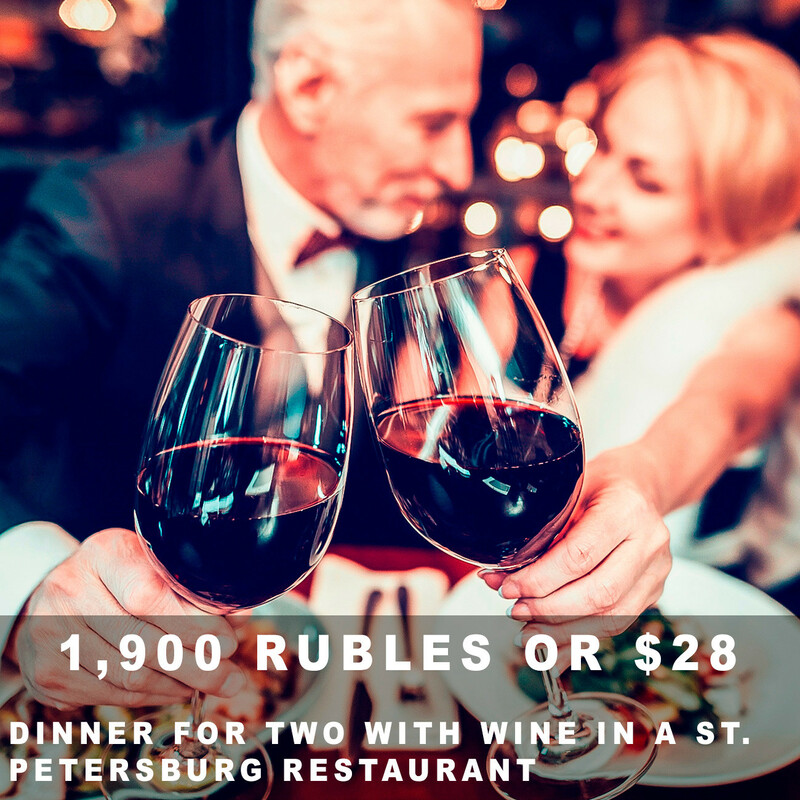 Dinner for two in a Moscow restaurant with a glass of wine will cost 2,500 rubles ($38) on average, but there are cheaper options. Teremok, Kroshka-Kartoshka, Mumu, or the more familiar McDonalds and KFC offer a bite to eat for 200-300 rubles ($3-4.50). Business lunches can also ease the strain on the wallet. They are offered on weekdays at many eateries. A business lunch costs about the same as one dish and a drink from the usual menu. For those who prefer home cooking, the cost-cutting supermarkets are Pyaterochka, Auchan, and Dixie, while the medium segment belongs to Perekrestok, Magnolia, and VkusVill, and the (relatively) high-end to Azbuka Vkusa (Alphabet of Taste). 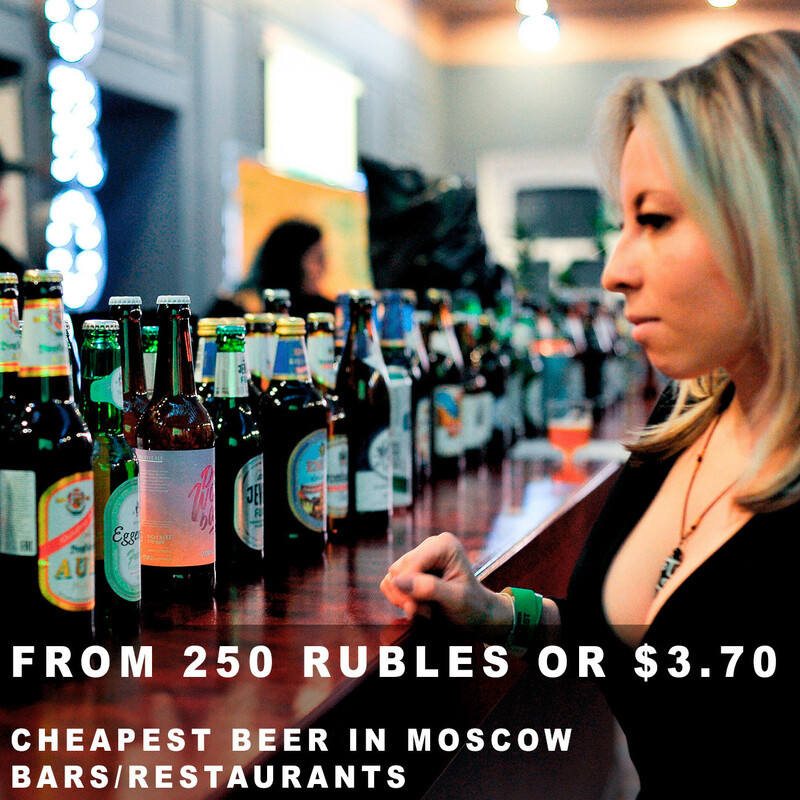 If you like a tipple, drinks in Moscow will be your biggest outlay. The average price of a cocktail in a Moscow bar is 400-600 rubles ($6-9). The optimal budget for one night is 3,000-5,000 rubles ($45-75). This amount will cover a few cocktails, one meal, and several cab rides. Let’s suppose this is your first trip to Moscow, and you haven’t seen anything yet. Be prepared to spend around 500 rubles ($7.50) per museum/gallery. 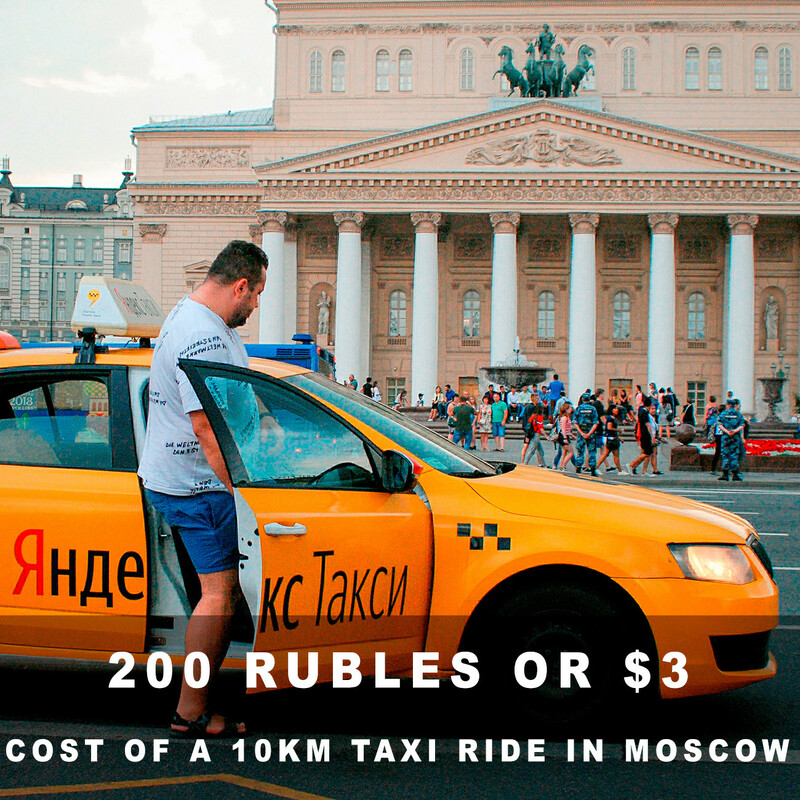 That is the price of entry to Cathedral Square, for instance, which is located inside the Kremlin and surrounded by palaces and ancient churches. It’s the same for a ticket to the Pushkin Museum of Fine Arts (unless you can pretend to be Russian). Let off some steam at the famous Sanduny baths, lined with baroque-style columns; prices here start from 1,800 rubles ($27), but the city is full of cheaper options. 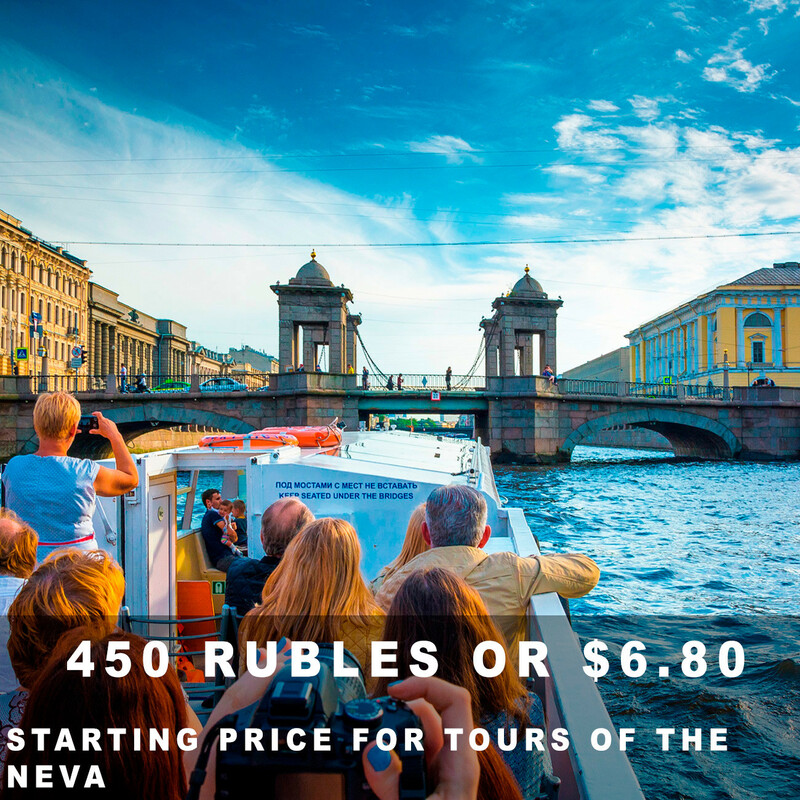 Cruise tours along the Moskva River also vary widely in price, but they start from 800 rubles ($12) per person. Our guide can help you land the best deal and avoid typical tourist mistakes. This sum will cover a budget hostel, two trips by public transport, and food (two meals at inexpensive cafes). There are various options for this popular route, from plane to bus or even taxi. 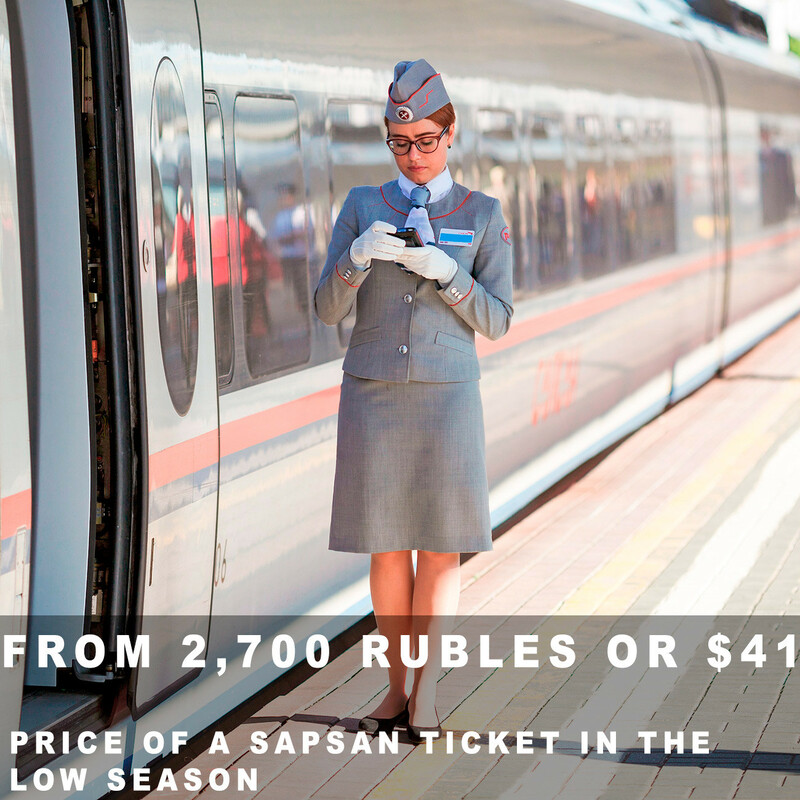 During the summer season, flights can hit 7,000 rubles ($106). But we strongly recommend Sapsan. This high-speed train will whizz you to St. Petersburg in 4 hours. Tickets can be bought online or at station ticket offices. Almost everything here is a bit cheaper than in Moscow. Prices for decent 3-star hotels start at 2,700 rubles per day ($41). Food is also cheaper: St. Petersburg has many inexpensive diners (serving home-style cuisine), some of which have no names and are simply numbered. 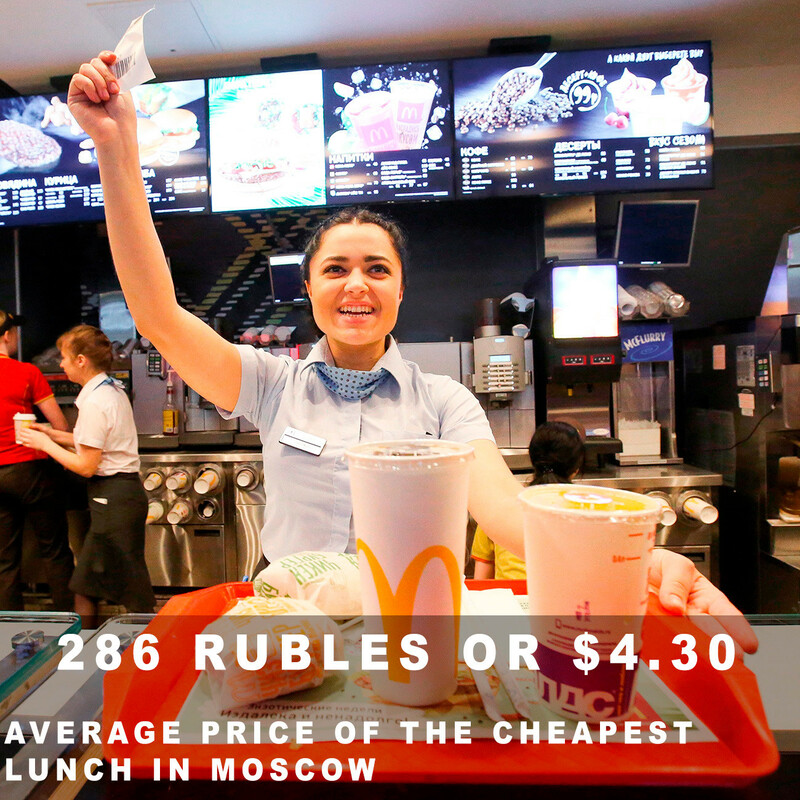 Try the popular chain Stolovaya №1, where lunch will set you back 100–250 rubles ($1.50–3.70). Street food snacks are available at numerous pastry and pancake houses such as Pirogovy Dvorik (Pie Yard) and Plyushkin House (from $2), while a cappuccino in St. Pete can be had for 87 rubles or $1.30. For the alcohol-minded, St. Petersburg offers lots of budget options. The local beer is definitely worth a sip and costs an average of 62 rubles ($9) per bottle. Strong alcohol can be knocked back in bars and pubs (like the diners, they often have numbers instead of proper names). A shot of vodka costs 45 rubles ($0.60). You can order an exotic cocktail in a St. Petersburg bar for 300 rubles or $4.50. The subway will take you there for 45 rubles or ¢60. Or go by taxi. St. Petersburg is heaven for culture buffs, its museums alone number around 300. 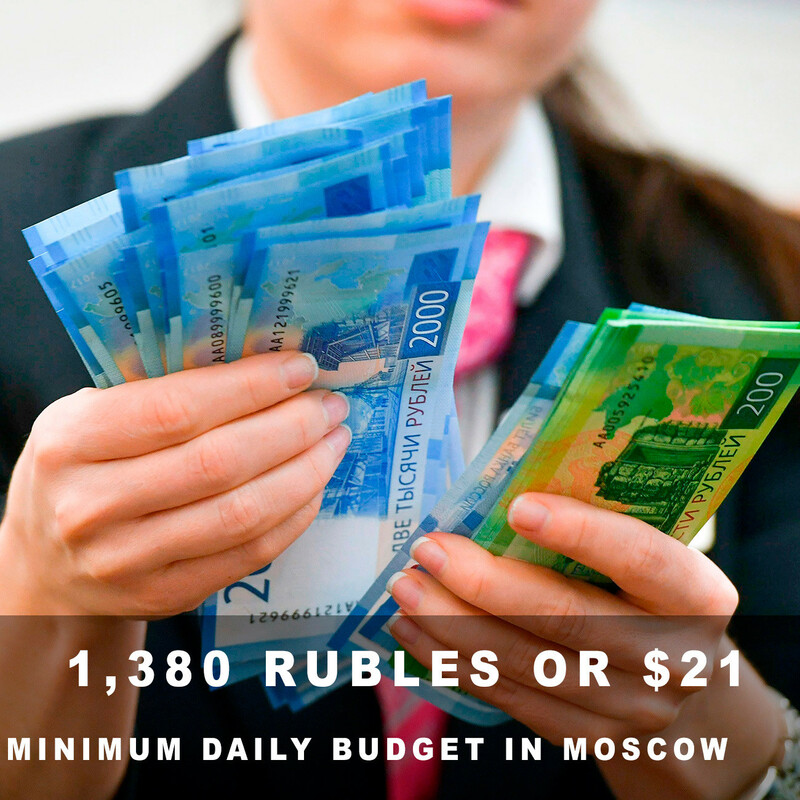 If you have only 72 hours to spare, the minimum program will cost approximately 2,250 rubles ($34). 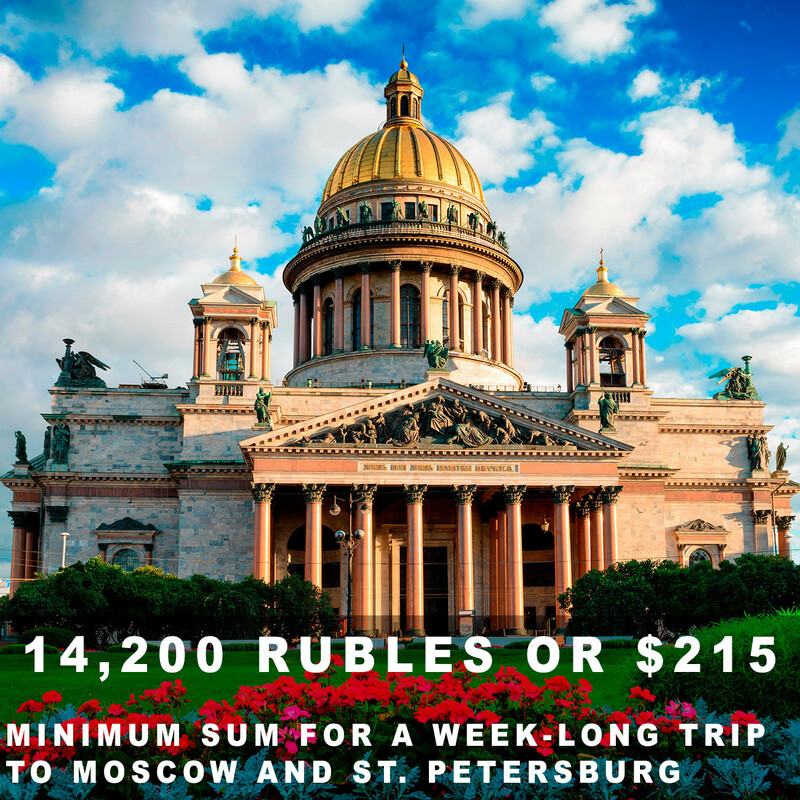 This will be enough to visit the Hermitage and Peterhof (the “Russian Versailles”), climb up to the colonnade of St. Isaac’s Cathedral, and take a boat trip along the Neva River. For trips to St. Petersburg, assume a minimum daily budget of 800 rubles ($12)—enough for a hostel, two subway rides, and two cafe lunches. *Data sources: Rosstat, Hermitagemuseum.org, Tripbest.ru, Triplinks.ru, Booking.com, Sravni.ru price aggregator.